Two contrasting engravings of Mary illustrate varying attitudes towards her reign after her death. Both are from Hume's History of England; the image on the left is from the 1792 edition; the more sympathetic view on the right is from the edition of 1826. Mary Tudor is chiefly remembered as a zealous Catholic, reviled for her bloody persecution of Protestants and for her attempt to bring England once again under the Roman Church. Like the popular medieval story of Grisilde*, Mary's life was an exemplum of inconstant Fortune*. As a young princess she was beloved by her father and had glowing prospects; she was betrothed in turn to the Emperor Charles V and King Francis I, but both matches failed for political reasons. After Henry VIII's divorce, Mary was declared illegitimate, deprived of her status as a princess and made lady-in-waiting to the new Queen's infant daughter, Elizabeth. Mary gained the throne with popular support and was an able ruler, as stubborn and strong-willed as her father. Her main failure was perhaps in attempting to reform the kingdom overnight. Moreover, her close relations with Rome and Spain aggravated a growing sense of English nationalism. Despite appeals from the Commons that she wed an Englishman, Mary formed a marriage alliance with Spain, the most powerful of the Catholic states in Europe*. Wyatt's Rebellion* (1554) began as an attempt to prevent her Spanish marriage, but was deflected by Mary's successful appeal to Londoners. Under Mary, all anti-papal legislation passed by her father and brother was repealed. She revived old heresy laws and in the subsequent three years of persecutions 300 Protestants were burned at the stake, including Thomas Cranmer. Mary's regime was further discredited by the loss of Calais, England's last stronghold on the Continent and a symbol of past glory. 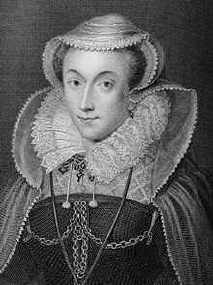 The Queen died in November 1558, and the attempted restoration of Catholicism was brought to an abrupt end with the accession of Elizabeth. Mary's end* can be seen as tragic. Chaucer tells this story in the "Clerk's Tale": an unsuspecting peasant girl becomes the chosen wife of a marquis, then is subjected to cruel tests of her devotion which culminate in a humiliating expulsion from his household, after which she is recalled to manage the menial details of the marquis' new marriage. But in the end Grisilde is accepted back by the misogynistic marquis and all is well (to the Medieval mind at any rate). "Fortune lost is worse than fortune never gained"
Though these lines are spoken in the play Henry VIII by Anne, the sentiments seem historically more befitting Mary than the ambitious Anne. The wheel of fortune was a common medieval figure for human tragedy. Ironically, by the end of Mary's short reign her husband Philip had been excommunicated by the anti-Spanish Pope Paul IV, yet another extremist reformer. Sir Thomas Wyatt, son of the poet, organized uprisings in southern and midland counties, intending to converge on London and place Elizabeth on the throne. Early discovery forced the rebels to act too soon, and most of the risings were easily suppressed. But Wyatt led a force from Kent, 3,000 strong, which posed a real threat to the Queen and was only stopped by London's defences. Wyatt and his followers surrendered, but public sympathy led Mary to pardon most of the rebels; only about 90 were executed, including Sir Thomas. Despite her promises to the people of London, Mary proceeded with her marriage to Philip. The gentry expressed their grievances more successfully through Parliament, which denied Philip authority in England and prevented Elizabeth's disinheritance. Mary's promise to defer to Parliament over the marriage issue was as sincere as Wyatt's speech for raising support: "we seek no harm to the Queen, but better counsel and councillors." This claim seems to be standard among most turncoats and usurpers, including Shakespeare's Northumberland in Richard II: "The king is not himself but basely led/By flatterers" (2.1.241-2). Mary's situation gradually improved after Anne Boleyn's downfall; thanks to the kind influence of Henry's later wives Jane Seymour and Katherine Parr, she at last regained her title and right as heir to the throne.